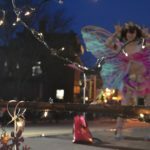 What’s new with DIY Lowell? There’s never been a better time to start connecting with DIY Lowell! We’re having a Community Chill Night fundraiser this March 9! 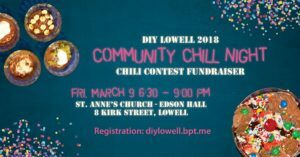 A special chili contest party with chili sampling, music, games, nonalchoholic drinks, community awards, and our famous “Chilly” DIY Sundae bar! We’ll have special activities such as lantern decorating for the Points of Light Lantern Celebration, photobooth, and learning about our 2018 projects. It’s the perfect way to break winter malaise for families, teens, seniors, and adults! Join the Facebook Event, register here, and join us for a special night. 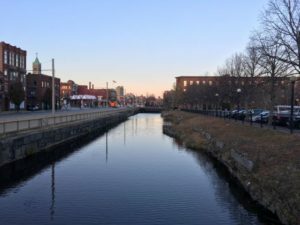 The Lowell Trash Machine is a community volunteer based project to design, construct, and operate an autonomous robot to remove floating trash from the historic canals. UMass Lowell students are designing and building the prototype, and the DIY Lowell team is running a naming contest, connecting with high schoolers to add creative elements to the utilitarian robot, and more. Learn more at their website! The Midsummer Dream event will be a summer day and night festival for kids and adults with a magical fairy theme, with a marketplace, costume contest, kids craft and storytime, and a special “traveling” production of Shakespeare’s classic “A Midsummer’s Night Dream” that will lead the audience through downtown, traveling from scene to scene. This event will be in honor of Lee Pho, owner of Little Delights and a force for magic and joy in Downtown Lowell, who we lost to cancer last year. DIY Lowell, Humanity Boutique, Pollard Memorial Library, and Studio 506 Theatre are partnering for the event, but we need community help! Our next planning session is Thursday, February 8. Join the Facebook event via the link!